Kevlar (tm) is one of the strongest and most heat resistant commercially available threads. This buying guide helps you select the right thread by explaining: Kevlar's uses and alternatives to Kevlar, Kevlar properties, sizes, and color; and specifications for standard sizes. Kevlar thread is stronger, more heat resistant, less stretchy, durable than most other threads. But, thread is usually a very small part of material content. This means that using Kevlar thread with materials that do not have its properties is a waste and could be dangerous. Decomposition - Kevlar begins to decompose (turn to ash) at about 800F (426C). Much higher than nylon or polyester. Melting - Kevlar thread does not melt. This is important in fire retardant gear. Stretch - Kevlar thread stretches about 2% before it breaks. For example, a 100 foot piece of Kevlar would be 102 feet long just before it breaks. If you sew stretchy fabrics with Kevlar the seams will pucker. Acids and Alkalis - Good resistance to dilute acids and bases. Degraded by strong mineral acids and to lesser extent, by strong mineral bases. This is important when Kevlar thread is used in a laboratory setting. Bleaching and Solvents - Should not be bleached. Excellent solvent resistance. This matters when Kevlar gear is reused. Mildew, Aging, and Sunlight - Excellent resistance to mildew and aging. Prolonged exposure to sunlight causes deterioration. Polyester thread works just as well in some cases.Abrasion - Good abrasion resistance. Nobody buys filament Kevlar thread for its color. It normally comes a color called Natural (yellow) and cannot be dyed after it is manufactured. Usually, color is not a problem because it takes a back seat to strength and heat resistance in most applications. There is some black filament Kevlar on the market. We sell it when available, but we do not have a steady source. Color is very important when it comes to fire retardant garments, turnout gear, and racing suits. Use Fire Retardant Sewing Thread for sewing seams and attaching patches; use Fire Retardant Embroidery Thread for embroidering names and logos. Machine Capability - Home, commercial and heavy duty sewing machines have different thread and needle size limitations. Needle Size - Needles have sizes that are best suited for specific thread sizes and machine types. Stitch Appearance - Are you looking for stitching to be inconspicuous, noticeable, very noticeable, or to be a focal point? Strength - Is the thread a suitable strength for what is being sewn? Commercial and Tex Equivalent numbers increase. Thread strength increases. Needle size increases. Needle heat and friction increase. Fabric ounce per yard increases. Machine Sewing - Use bonded thread for Sizes 69 and higher; bonding does not matter with thinner size thread. Wrapping and Whipping - Bonding may interfere with adhesives. It can be removed by soaking the thread in alcohol. Hand Sewing and Hanging - It does not matter if the thread is soft or bonded. Left Twist / Right Twist - When threads have more than one ply the plies are twisted to the left or the right. Unless we say otherwise our thread is left twist. This is because single-needle machines made for the U.S. market require left twist or monocord thread. Use right twist thread with double-needle machines and some machines designed for Asian markets. Twist does not matter in hand sewing and non-sewing applications. Loose Twist / No Twist / and Yarn - These kinds of threads are frizzy and almost impossible to put through a needle. Consider them for non-sewing applications such as wrapping and hanging. Do you really need Kevlar? - Kevlar seems to have a cult following and customers buy it when less expensive nylon or polyester will do the job. Please, ask yourself or ask us if you really need Kevlar thread. Buy what you need - Our junior spools in 1 to 4 Ounces, coils, and thread packs are a great value for specific, one-time jobs and hobbyists. They generally ship 1st Class to U.S. addresses so shipping costs are low compared to price. Choose lighter weights - You get more yards per ounce with lighter weight thread. But, make sure that the thread has the strength you need. Consider non-standard sizes and closeouts - These threads sell at a 25% to 50% discount compared to our regular thread. Our featured Tex 105 and Tex 300 Kevlar thread is on par with our standard sizes. But, we cannot provide certificates of conformance (CERTS) and will probably not restock them in the future. Our closeouts are old thread that sells at very low prices, but is not recommended for machine sewing. Nylon and Polyester Thread - Use a heavier weight nylon or polyester thread instead of a lighter weight Kevlar. For example, a Size 138 nylon or polyester thread has about the same strength as a Size 69 Kevlar thread, costs about 80% less, and comes in colors. But, it is twice as thick, not fire retardant, and has 25% elasticity. Fire Retardant Sewing Thread - Spun Kevlar and spun Nomex threads have about the same fire retardance as Kevlar thread and are available in many colors. This type of thread is the usually the best choice for sewing seams and attaching emblems and logos. These threads look and feel like cotton because they are made by wrapping cotton around a Kevlar or Nomex filament core. Fire Retardant Embroidery Thread - Use Nomex embroidery thread to embroider logos and emblems for fire retardant gear. The thread looks like top-quality, 40 weight, polyester embroidery thread, but it is just as fire retardant as Kevlar thread. It is not strong enough to sew seams or attach emblems. It is very expensive and should only be used when fire retardance is essential. Filament Nomex Thread - This thread has about the same fire retardance as filament Kevlar but only 1/3 of its strength. It has a smooth, shiny feel. We are discontinuing this thread because reliable supplies are not reliable because of government priorities. Cotton Thread - Cotton is not fire retardant, but it does not melt. It chars, then turns to ash similar to Kevlar. Its strength is comparable to regular sewing thread. We sell most of our Kevlar thread in 1, 2, 4 and 16 Ounce (1 Pound) spool sizes or putups. The smaller putups cost more per ounce than the larger ones. But, they are a better choice for one-time jobs, casual sewing, people who need a stash of many colors, and experimenters.Kevlar thread is sold by weight (ounces, pounds) - not yards. This is because the number of yards-per-pound decreases as thread thickness increases. Selling by weight means prices for a given size spool are about the same across most thread sizes. All of our Kevlar thread is wound on king spools unless otherwise noted. Most of our 2 and 4 ounce spools are wound in-house, and the spool sizes are consistent for those. Normally, manufacturer spool dimensions are consistent. There are some times one-off occasions where manufacturers will wind 12 and 16 ounce spools with different heights, ranging from 6.5" to 7.5", but the base dimensions remain constant. 1 Oz - Base: 2.5", Height: 4.5"
2 Oz - Base: 2.5", Height: 4.5"
4 Oz - Base: 2.5", Height: 4.5"
8 Oz - Base: 3.0", Height: 5.25"
12 Oz - Base: 4.5", Height: 6.5"
16 Oz - Base: 4.5", Height: 6.5"
For sewing machines not geared to handle these size spools, a Thread Cone Holder may be needed. It is designed to help machines bypass these limitations. There are also DIY thread cone holders that are can be made from PVC pipe, wire coat hangers, or coffee cups most notably. The advantage of a thread cone holder is that it is specifically designed for sewing. We also carry Hand Stitching Tubes. They are not particularly designed for machine sewing, but customers have created Do-It-Yourself adaptors. It is important to note that DIY projects can cause machine damage or create tensioning issues if not made properly. Industry norms allow Kevlar thread spool weights to vary by plus/minus 10% from the stated nominal weight. This means that customers get slightly less or slightly more thread than the nominal weight shown on our site. This chart shows our nominal weights and the thread-weight range ( including the spool's weight ) for various sizes. When spools fall within these ranges, we do not charge for when they go over or refund for when they go under. It is important to note that we usually do not charge when a spool goes over the maximum tolerance, but we will always refund when they go below the tolerance. We can email manufacturer's CERTS for our 16 Ounce, standard size Kevlar. We cannot provide CERTS for any non-standard size or closeout thread. CERTS apply to specific batch / lots. We wind our smaller spools from the 16 Oz standard size spools and do not keep batch or lot information for these spools. We can send a "representative" CERT for these spools that applies in a general way to the thread purchased. Please call if you must have batch or lot traceable CERTS on small spools and are willing to pay a $2 a spool up-charge. Our Kevlar thread is clean in the ordinary sense. But, it is not sterile and using it in any medical device could put lives at risk. We will not knowingly sell Kevlar thread for use in medical devices. Commercial sizing is most widely used thread size standard. 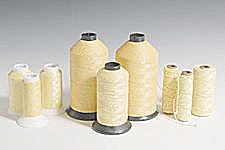 Our Kevlar thread shopping selections are listed in commercial sizes. Occasionally we have some off sizes. When this happens, we use the closest Tex Equivalent to the commercial size. Government sizes fall under Military Specification A-A-55220.